Evidence of the antiquity of the Earth is everywhere we look if we have our eyes open and are pondering what we see. One such place is central Utah on a typical rocky mountainside above 8000 feet just southwest of Fish Lake. This is where you will find Pando. Pando is the name given to a large grove of white and black-barked aspen trees. In fact there are over 4600 aspen trees in this grove which covers over 100 acres of mountainside on both sides of a road established more than 50 years ago. You might also find it interesting to learn that all of these trees are male (aspens are dioecious meaning each individual organism is either male or female and in this case all the trees of this forest produce pollen but there are no females so no trees are capable of producing fruit). In fact, in the 1970s Burton V. Barnes studied this particular grove and based on the many similarities of the trees he speculated that all of the trees in this forest are in fact one single organism: a single giant clone. It has since been estimated that the above ground shoots and their roots account for some six million kilograms (over 13 million pounds) making it arguably* the largest known single individual organism on earth eclipsing the giant sequoia General Sherman by at least three times. 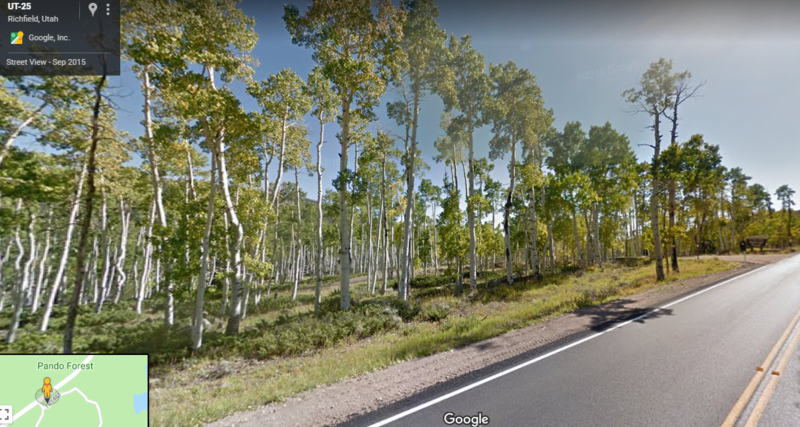 Google Streetview screenshot of a portion of the Pando aspen grove in Utah. All of the trees in this picture are believed to be a single organism having been derived from roots of the progenitor shoot that has long-since fallen down and decayed. Barnes suspicion that the Pando forest was a single entity was confirmed in 2008 when geneticists collected samples from across the forest. They discovered that each tree in the forest was far more similar to one another than any two separate individuals could be. They appear to be identical twins vs sisters, brothers or cousins. There was some genetic variation among the trees but that variation was within the amount expected in a single individual. You can think of this as the variation you have in cells in your pinkie on your left hand compared to your right hand. As your cells divided early in your life some mistakes were made copying your DNA such that the genomes in each of the cells of your body are not 100% identical though they are far more similar to each other than they would be to your sister or brother. Likewise, the trees of this forest all appear as identical twins rather than as related siblings. Although massive in extent this is not particular surprising given that almost all aspen groves in western North America are clonal organisms. Each began as a single individual presumably from a germinating seed. Once that tree was well established, additional trees were produced by “suckering” which means that shoots are able to come up from the roots of the parent tree. When the above-ground portion of the parent tree was killed in a fire or damaged by wind or snow or insects the “suckers” would continue to grow and replace that tree in the canopy. Eventually those second generation trees continued to produce more roots which give rise to more sucker trees. This goes on and on and the colony expanded out in very direction as long as it wasn’t obstructed. This process could potentially play itself out over tens or hundreds and thousands of years. Most aspen clonal colonies cover only an acre or two and are only hundreds to a few thousand years old but some can cover dozens of acres depending on how long ago they were established and the growth rate in that particular community. Pando is the largest known single aspen clone and currently occupies more than 100 acres of mountainside. Pando: another testimony of an Earth well over 6000 years old. This aspen grove grows above 8000 feet high in Utah on a rocky slope with poor soils and a relatively short growing season. This region has been colder in the past and so the trees would have grown even slower in the past than their very slow pace of the present. Taking the growth conditions, huge size and genetic variation across the forest into consideration, scientists who have studies aspens and other similar trees in the western US estimate that the root system of this individual colony could be 80,000 years old and possibly several hundred thousand years old however it may be as young as the end of the last Ice Age or about 14,000 years (see: Rogers and McAvoy, 2018). This makes Methuselah the 4850 year-old bristlecone pine tree from California look like a youngster. Young-earth creationists (YECs) are very familiar with Methuselah. Ever since biologists dated the tree to an age over 4800 years by counting annual growth rings YECs have found it necessary to question that dating method since they believe that Noah’s Flood destroyed the Earth’s surface only 4350 years ago. Therefore, they believe the tree must be much younger that biologists have reported. In 2008 a group of Norway Spruce in Sweden was dated to over 8000 years old using Carbon 14 dating. YECs have responded to this discovery in a similar fashion by questioning the reliability of C14 dating. Despite a similar amount of press coverage for Pando that was given to the ancient spruce tree in Sweden the same year it is a bit surprising that I have found no mention of Pando by any of the largest YEC apologetic ministries including Answers in Genesis (AiG) and the Institute for Creation Research (ICR). The existence of Pando, like Methuselah or the Norway Spruce group, is a simply and intuitive evidence that the world is older than proposed by YEC apologists. In some ways Pando is the best witness of an ancient earth of the three because of the multiple independent lines of evidence of great age. In each case, though, a simple straightforward interpretation of the evidence points to ages that are thousands and tens of thousands of years older than YEC predictions. The YEC response is to propose extraordinary, unintuitive and unsupported claims that standard methods of collecting and interpreting data are incorrect. However, standing in a 100 acre forest of 4600 trees and recognizing that they are all born of the same seed it becomes apparent that this stand of trees has required more than a few thousand years to grow into the massive organisms that it is today. Grant, Michael C. (1993-10-01). “The Trembling Giant”. Discover Magazine. Retrieved 2008-05-08. Research and Development Information Outreach, USDA Forest Service (Fall 1999). “Quaking in Their Roots: The Decline of Quaking Aspen”. Natural Inquirer. US Department of Agriculture. 2 (1): 7–11. DeWoody, J.; Rowe, C.A. ; Hipkins, V.D. ; Mock, K.E. (2008). “”Pando” Lives: Molecular Genetic Evidence of a Giant Aspen Clone in Central Utah”. Western North American Naturalist. 68 (4): 493–497. doi:10.3398/1527-0904-68.4.493. OECD Environment Directorate (2000). “Consensus Document on the Biology of Populus L. (Poplars)”. Organisation for Economic Co-operation and Development. Archived from the original on 2006-12-15. Retrieved 2006-10-08. Andrei (February 9, 2015). “The Heaviest Living Organism in the World”. ZME Science. Cover image (below): This isn’t Pando. 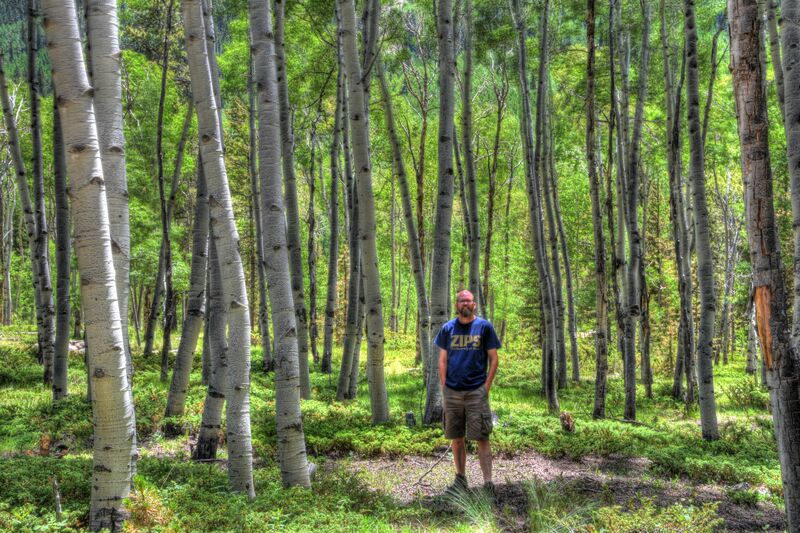 Rather, I am standing in a aspen grove in Colorado. All of the trees here are, like Pando, likely a single clone started by a single seed. I would not be surprised if this aspen grove which covered several acres is over 1000 years old. *I say “arguably the heaviest” because it is difficult to define what constitutes a single organism. There are fungi that could possibly be larger but are hard to quantify. « A Young-Earth Mystery: If Dinosaurs and Humans Lived Together Before the Flood, Where are the Fossils? Thanks so much for sharing your careful research with us! Wow, that is crazy. I’ve looked at that title 100 times and it has been shared 100 times and had hundreds of FB comments and no one has said anything. Just goes to show that most of our brains automatically fill in the right world. Thanks so much for pointing the error out. I’ve made the change.